The Plum Nelly shop is currently owned by Catharine Daniels, the fourth in a continuous succession of women to own the shop since its inception. She continues the tradition of quality at Plum Nelly and invites you to sample a bit of Chattanooga history when you are looking for a unique gift or a treasure for your own home. It began in 1947 at an outdoor art show held at Fannie Mennen’s house on the back of Lookout Mountain, Georgia. Ms. Mennen’s property had years earlier been named Plum Nelly when her brother-in-law, Louis Marks, after driving, what to him seemed a long way from Chattanooga, remarked, “Fannie, your place is plum out of Tennessee and nearly out of Georgia.” (Louis’s Virginia Tidewater accent was responsible for the change from nearly to nelly.) Only three hundred people attended that first show in the Plum Nelly Woods, but within a few years, the Plum Nelly show had grown to be a bona fide event, attracting as many as 20,000 Southeastern art lovers in a single October weekend. The Plum Nelly Shop was established in 1972, the last year that the Plum Nelly Clothesline Art Show was held on the back of Lookout Mountain. For several years, the shop was owned by Fannie Mennen, her sister Celia Marks, Cornelia Burdeshaw and Liz Phillips. The shop’s day to day operations was primarily the responsibility of Celia Marks, and soon Mrs. Marks became the driving force behind the shop. Her name and Plum Nelly became synonymous, just as her sister Fannie’s name had for years been associated with the Plum Nelly shows. With help from her husband Louis, the Marks’ developed the shop into one of the region’s best craft shops. For them, there was no substitute for the best and it was this dedication to quality that developed the shop’s reputation. In June, 1985, the Plum Nelly Shop was purchased by Joy Storey and Linda Hall. Ms. Hall’s involvement with the shop was brief and Jim Storey joined his wife, Joy, in the store’s operations. Several months later, Plum Nelly moved a half block into a new shopping complex, The Corner at Riverview. It occupied almost 3 times the space it had previously in its small shop location on Hixson Pike. Entire new categories of crafts were added; glass, jewelry and wearable art. Pottery, which had been a long-time Plum Nelly mainstay was greatly expanded. Plum Nelly had, within a short time, joined the ranks of the elite in American craft galleries. The formula for success was a continued dedication to quality, following the pattern started almost half a century earlier in the Plum Nelly Woods. In 2004, Beth Gunn bought Plum Nelly and kept the true vision that Celia Marks had established. 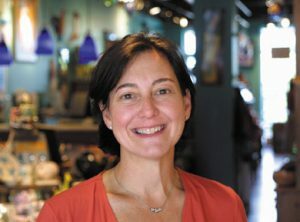 Beth not only supported artisans, but wanted to contribute to the growth of Chattanooga. She hosted numerous fund raiser, donated to many charitable organizations, and gave back to the community in countless ways. In 2006 she moved the shop to it’s current location on Frazier Avenue. The Plum Nelly shop is currently owned by Catharine Daniels, the fourth in a continuous succession of women to own the shop since its inception. She continues the tradition of quality at Plum Nelly and invites you to sample a bit of Chattanooga history when you are looking for a unique gift or a treasure for your own home.